Ministry of Propaganda - 19/Feb/2005: "Liddington Castle"
My mother sent me an e-mail last night that it had snowed in Bremen, Germany, attaching a picture of a snowed under front garden. 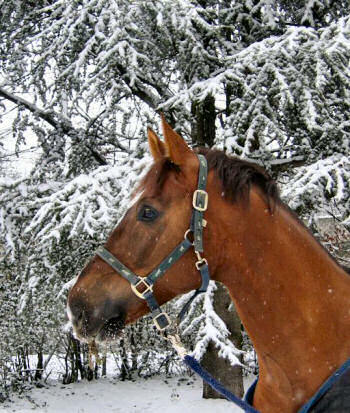 This morning my sister followed up with two pictures of horses in the snow at the Reiterverein Heidelberg. Apparently the horses (or at least this one) were enjoying the snow, unlike the humans who were struggling with driving their cars. Nothing like that here in Swindon: While it was fairly cold there was no snow in sight anywhere. It was clear and sunny when I stood up in the morning, although some clouds started to appear around noon. The walk I had planned to participate in on Sunday was cancelled, so I decided to use the nice weather and go for a walk today. I didn't want to drive too far, so I settled for a walk to Liddington Castle and along parts of the Ridgeway, leaving from Folly Barn near Chiseldon. After parking the car I left along a footpath leading up to the Ridgeway. I joined the Ridgeway about a mile south of Liddington Castle on a section where vehicles are prohibited. Walking on the Ridgeway is quite pleasant here, as it is not as badly damaged as it is in other sections. A quite fierce and cold wind was blowing though making it feel quite cold for a while until I had walked long enough to warm up. 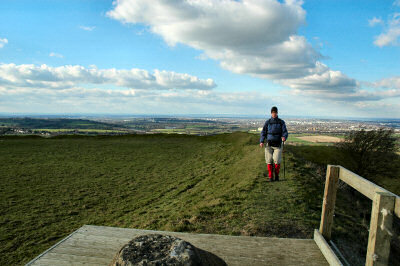 Soon I arrived a the footpath turning off to Liddington Castle. Despite its grand name there isn't really that much to see, for the simple reason that Liddington Castle (same as neighbouring Barbury Castle) is an Iron Age hillfort. The only things to see are the earth walls and the ditch. The wind was particularly fierce here, as the castle is on the highest point of the area. 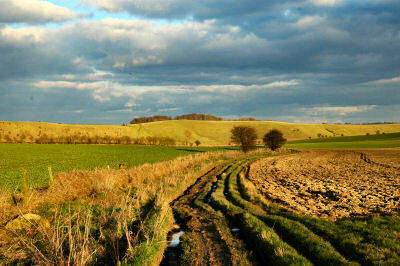 After a walk around the earth wall I returned to the Ridgeway and continued towards Liddington. I crossed the B4192 and joined the Aldbourne Circular Route, turning south again until I reached Sugar Hill. Here I turned west again to make my way back to the car. After crossing the B4192 again I joined the Ridgeway on a section where vehicles are allowed, and it showed: The path was badly rutted, deep grooves in places more than a foot deep made walking not very pleasant. By now it was late in the afternoon, the low sun giving some nice light and pretty views. With dusk setting in I arrived back at the car after a nice walk, I estimate around 6 miles in around 3 hours (with plenty of photo stops). Depending on how the weather develops on Sunday I might go walking again, possibly slightly further away around Castle Combe.